so i recently bought this everyday facial wash from boots only really because it was on offer and i had seen it advertised. I have terrible skin, dry, prone to spot break-outs constantly and really senesitive and tbh i've spent quite a lot of money buying all these lotions and potions and still nothing works from the cheap to the expensive. so this is the daily scrub, but there is also a facial wash too. so firstly its pink which is cute right? also it smells so nice!! 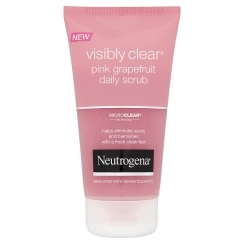 so i thought why not lets get it..
An uplifting daily facial scrub with powerful MicroClear® technology and exfoliating micro-beads, the formula unclogs pores to clean deeply and help eliminate spots and blemishes. The refreshing scrub gently purifies the skin without overdrying, while a wave of pink grapefruit uplifts the senses with a burst of invigorating freshness. i just splashed my face with some warm water and then massaged this in it has like little beads in it so don't scrub too hard or it gets a wee bit sore, and i usually just wet a little exfoliating sponge and rub it in too release all the lather, just in circular motions all over then just wash it off with warm water..it does leave your skin feeling really clean and soft and i do again before i go to bed. i've been using it for about two weeks now and althoug it hasn't made me look like a supermodel it hasn'tmade me look like a pizza either and it's actually not brought out any rashes or anything so for that fact alone i'm goign to keep with it for £4 it's a pretty good wee number and the bonus of it not irritating my face is even better!! having a wee study break. Having a bit of an off day today.